The Kingdom of Norway (Kongeriket Norge), a country in Scandinavia, is frequently associated to the Vikings and it was a Viking king, Harald Fairhair, who unified the Norwegian nation in one reign, around the middle of the 9th century and the 10th century. The Vikings helped form Norway approximately one century later. The Viking Era was an important period for the formation of the Norwegian culture and the Norse mythology. Christian missionaries traveled in Viking lands as early as 825 AD, when Saint Anskar visited trading centers in Sweden and Denmark. Conversions from paganism to Christianity were infrequent, however, until the end of the 900s. In 995 Olaf I, a great-grandson of Harald I, became king of Norway. Before his accession Olaf had lived in England, where he had converted to Christianity. He took the throne with the firm purpose of forcing Christianity on Norway and he partially succeeded. Five years after his accession he was killed in battle, and Norway was divided for a short time. Norway was reunited by Olaf II, who made himself king of Norway in 1015. He continued the religious work of his predecessor, using force against those who refused a Christian baptism. By about 1025, Olaf II had become more powerful than any preceding Norwegian king. He aroused the anger of powerful nobles, who, together with Canute II, king of England and Denmark, drove Olaf into exile in Russia in 1028. Two years later Olaf returned to Norway and was killed in the Battle of Stiklestad. Although a Viking king, he was seen as a martyr for the church. He was canonized as Norway’s patron saint, following reports of miracles associated with him. 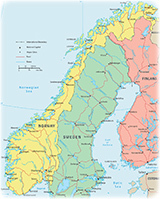 In 1397, the kingdoms of Norway, Denmark, and Sweden were made a single administrative unit. Sweden and Denmark were larger and wealthier than Norway, which had lost much of its population and many of its farms in the mid-14th century during an outbreak of bubonic plague. In 1523 Sweden dropped out of the union, and Norway was increasingly treated as an appendage of the Danish crown. After the defeat of Napoleon, in 1814, Denmark was compelled to sign the Treaty of Kiel, ceding Norway to the king of Sweden. The Norwegians, however, disavowed the treaty. They declared themselves an independent kingdom, drew up a liberal constitution, and offered the throne to the Danish crown prince Christian Frederick. The Norwegian move was opposed by the European powers, and the head of an army, Marshal Jean Bernadotte, persuaded Norway to accept the Treaty of Kiel. In return for its cooperation, Norway was allowed to retain the newly promulgated constitution. By the Act of Union of 1815, Norway was given its own army, navy, customs, and parliament and was permitted full liberty and autonomy within its own boundaries. 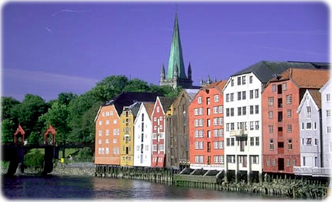 Nearly half of the population of Norway live in the far south, in the region around Oslo, the capital. About 3/5 of Norway is mountainous and off its much-indented coastline lie, carved by deep glacial fjords, some fifty thousand islands. In central Norway the low, flat valleys surrounding the city of Trondheim are among the country’s most important agricultural regions. At the center of this region is the broad Trondheimsfjord, a body of water sheltered from the sea by peninsulas and islands. The larger rivers of Norway are found in the east, where the country’s longest river, the Glåma, has a course of 610 km. With its tributaries, the Glåma drains about 1/8 of Norway’s area. In the west rivers are generally short and swift, with many rapids and falls. The longest river in northern Norway is the Tana. Flowing north into the Barents Sea, it forms part of the frontier with Finland, and it is renowned as the country’s most important salmon-fishing river. Norway has tens of thousands of glacial lakes. The largest is Lake Mjøsa in the southeast, with an area of 390 km². The Wharf at Trondheim, Norway. 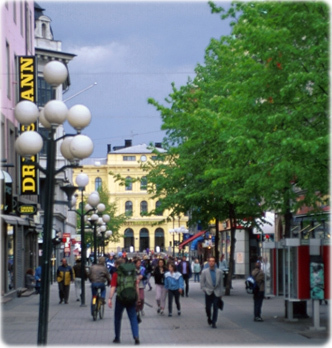 Street in Oslo, Norway's capital.